Christine Reinhart spent her summer at Weir Veterinary Services as part of her preceptorship. Submitted photo. 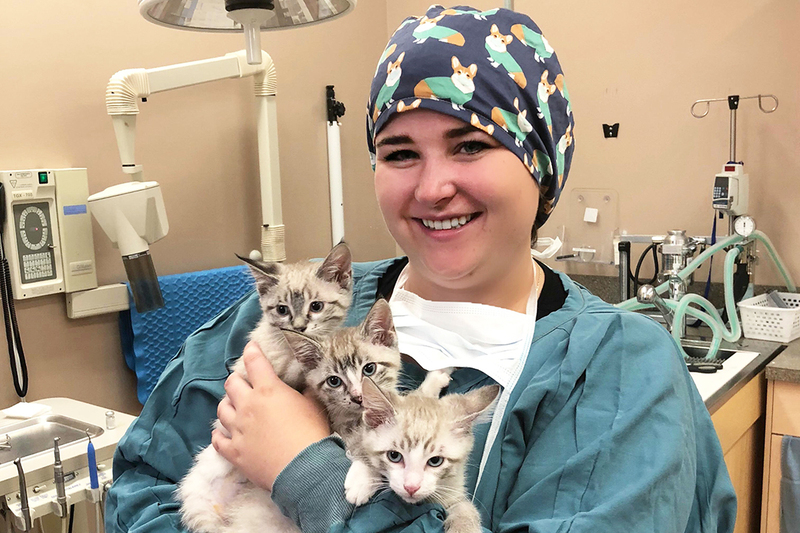 A new program through the Saskatchewan Veterinary Medical Association (SVMA) is giving third-year veterinary students an opportunity to gain more hands-on experience before starting their final year at the Western College of Veterinary Medicine (WCVM). 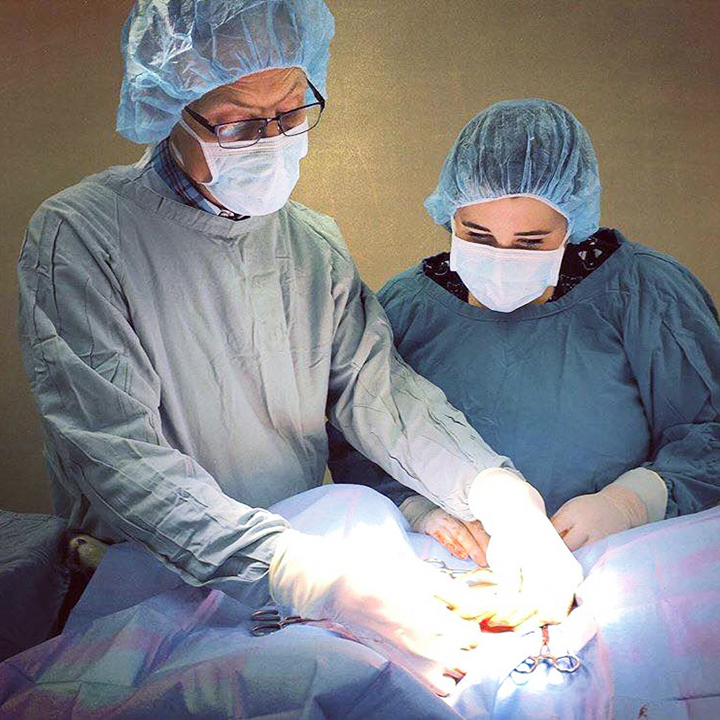 Christine Reinhart, right, assists her mentor, Dr. Glenn Merth, during a canine spay procedure. Submitted photo. The SVMA’s preceptorship program is a partnership between the veterinary medical association, the Saskatchewan Cattlemen’s Association (SCA) and the rural veterinary practices in Lloydminster, Melville, North Battleford, Mankota and Ogema where the students worked for 14 weeks this summer. Each student receives a $10,000 wage with funding coming from the SVMA, its Preceptorship Program Fund, and the individual practice. “Because it's a pilot, we decided to only start with five students. We wanted to get some feedback from the practices and the students as to how it went,” says Lorraine Serhienko, the SVMA’s administrative co-ordinator and spokesperson for the program. The preceptorship program specifically focuses on rural practices because of the struggle the SVMA has recently seen in rural practice. While many veterinarians are willing to work in urban centres, it’s been difficult to attract practitioners to smaller communities in the province. “We have clinics that have been closing their doors or considering it because they [their owners] can't find veterinarians who want to work in rural Saskatchewan,” says Serhienko. Ryder Lee, chief executive officer of the SCA, agrees the need for veterinarians is high in Saskatchewan. “There are parts of Saskatchewan where there are ‘veterinarian deserts,’ and we want to hopefully see those holes filled as soon as we can — and filled by competent vets who want to focus on large animals,” says Lee. He adds that members of the SCA board were intrigued by the preceptorship program and wanted to support a worthwhile initiative that would help to serve the interests of Saskatchewan cattle producers — the organization’s funders and key stakeholders. One of the students participating in the program is fourth-year veterinary student Christine Reinhart from Lashburn, Sask. She worked at Weir Veterinary Services, the same clinic where she also participated in the SVMA’s mentorship program a couple of years ago. That program allows veterinary students to experience rural veterinary practice between their first and second years of the veterinary program. After participating in both SVMA programs, Reinhart’s plans for working in a rural practice are becoming much more concrete. What has also impressed her is that Saskatchewan cattle producers are working with the SVMA to bring the preceptorship program to life. As a fourth-year student with more knowledge under her belt, Reinhart was able to jump right into action this summer. For example, by 11 a.m. on her first day at work, she was working on a cow with a prolapsed uterus. “So it's kind of been that sort of summer,” Reinhart says with a laugh. She adds that these experiences have made her feel like she could really be a cow vet one day. Getting the chance to work on a variety of cases is exactly why Dr. Chris Clark — the WCVM’s associate dean, academic — supports this program. Clark says this extra experience before a student’s fourth year is extremely beneficial. They get to see the everyday, run-of-the-mill cases that students don’t always see at the WCVM Veterinary Medical Centre. They also get a chance to see how things work when you don’t always have an expert to consult when a case comes in — a big difference between the environment at the WCVM and private practice. “Say you don’t know what's wrong with the animal: you decide you want an ultrasound examination, so you go and find a radiologist to do it for you. Or if you want to run some blood work and you're not sure what the results mean, there's a clinical pathologist down the corridor,” says Clark. The five students have wrapped up their summer experience, and Serhienko says the SVMA and its partners already have a good feeling about the preceptorship program’s future. Serhienko hopes the summer experience will help the students fall in love with rural life. And even if they decide to go to another practice — or open their own practice — in a rural community, the program’s partners will still consider those results as a reflection of the program’s success. Article re-posted on 2-Apr-2019 5:07:18 PM .